Chautauqua Amp's unique design modernizes historic venue. The main PA system is configured to cover the main seating area and the bleachers behind the stage. “The most American thing in America.” That’s how President Theodore Roosevelt described Chautauqua—the place and the idea. Founded in 1874 as an adult-education movement, Chautauqua took its name from the western New York town and lake, where the concept first began with what would become an array of entertainment and cultural events each summer. The idea spread across rural America in the 1920s before, ultimately, receding. However, the original location has retained its magic and its allure. Each season, the 750-acre grounds host thousands of visitors, who come for the unique mix of fine and performing arts, lectures, interfaith worship and programs, and recreational activities. 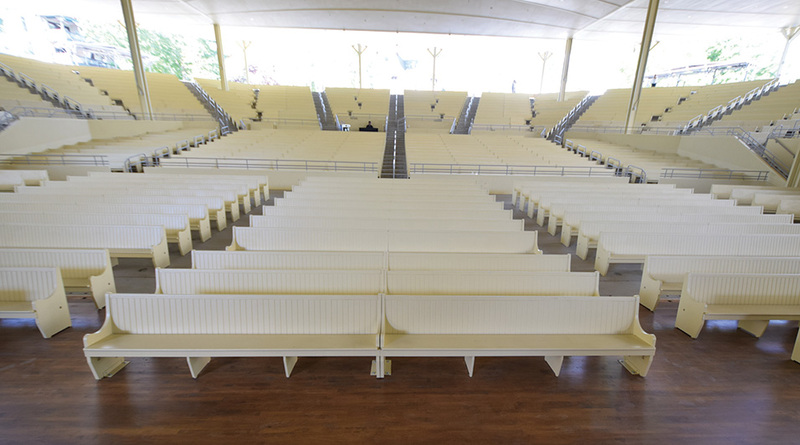 The centerpiece of the Chautauqua Institution (the proper name of the non-profit organization) is its Amphitheater—the Amp, as it’s known. The original structure was finished in 1893, and it was the site of numerous historical events, including presidential addresses. 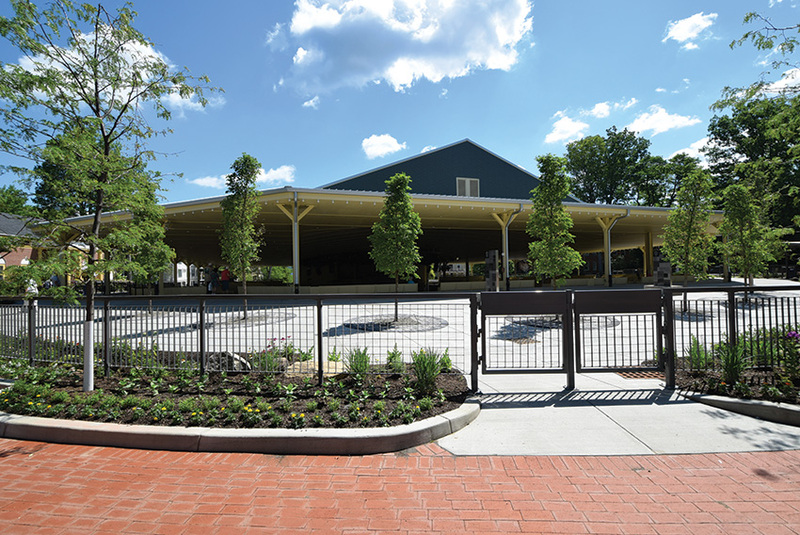 It was torn down in 2016, amid some local controversy, to make way for a new venue that hewed very closely to the original, both architecturally and emotionally. However, it also provided for very 21st-century AV considerations. 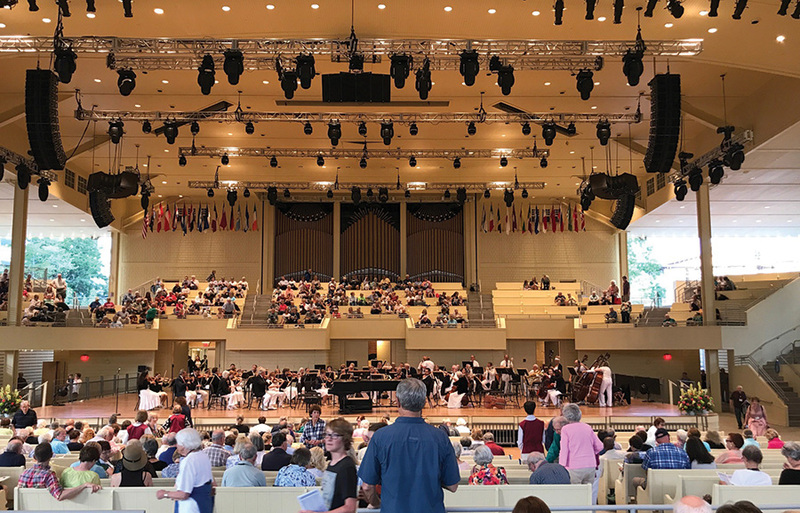 Originally constructed 124 years ago, the newly rebuilt Chautauqua Amphitheater—the Amp—has more cabling and other AV infrastructure than most venues its size. However, its main AV components only come out for a few months each summer. The first thing one notices about the Amp is that it’s an open-sided shed design. In an area that can get well below freezing for much of the winter, that presents an immediate challenge for AV. “You don’t want a PA system that freezes and thaws, freezes and thaws, over and over again,” Ben Bausher, Principal of Audio/Video and the AV project lead for the Chautauqua project for acoustical consultant Jaffe Holden, observed. 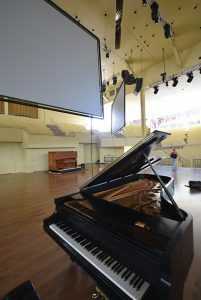 Thus, the unique nature of the venue’s AV: most of its main components, such as the PA system and the projectors, are leased, and they’re installed each spring and taken out at the end of the fall season each year. The Amp purchased a new Yamaha CL5 console (and two RIO I/O racks) as part of the renovation; however, it, too, is always ready to move, ensconced in the wheeled bottom of a touring case. Advanced Production Group (APG), in nearby Dunkirk NY, has been the Amp’s audio systems rental provider for the past two decades, whereas Grisé Audio Visual in Erie PA has been the projection rental vendor. It’s the venue’s AV infrastructure that remains in place year to year; that was the focus of Ronco Specialized Systems, the AV integrator that worked on the new Amp. And there is certainly plenty of infrastructure. According to Dean J. Churpita, Ronco’s technical project lead for the Amp project, there are now three distinct layers of cabling and signal transport in the venue—a fully analog/copper cabling infrastructure, a Cat6 layer to accommodate networked digital audio, such as Dante, and a single-mode/multimode fiber network. Those result in a total of more than 4,000 cable terminations throughout the venue, about half of which are for the copper cables, mostly Whirlwind W1 and W4 connectors, and much of which are in the form of 56- and 12-pair copper snakes that carry audio from amplifiers both to the main PA—an L-Acoustics Kara system, powered by an LA-12X amplified controller—and to the 94 QSC AD Series speakers, powered by QSC ISA500Ti amplifiers, that cover the back-of-house areas, including green rooms, dressing rooms and rehearsal areas. Audio routing and format conversion is through BSS London processors located in the venue’s new main control, amp room and new central patch room. The patch room is the central hub for all signal transport within the Amp. That, alone, was a unique challenge for an AV integrator; so, too, was the reason for what turned out to be the barely one-month timeline in which Ronco had to accomplish it. 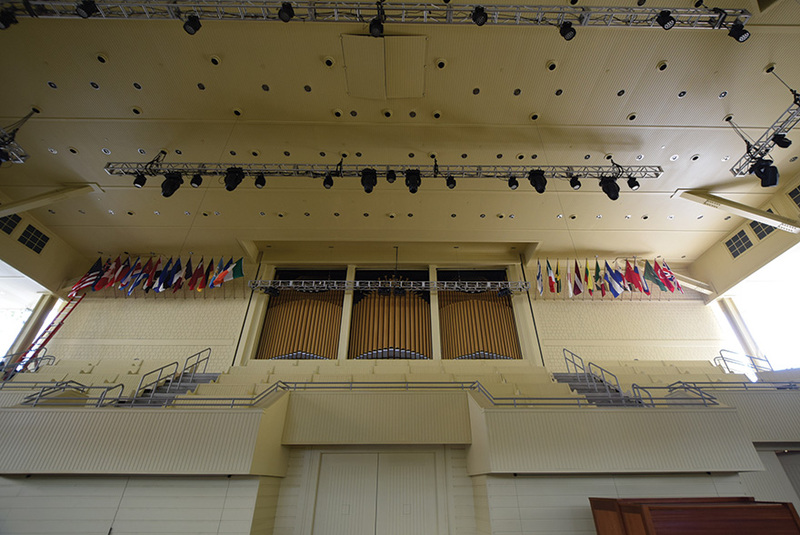 The Amp is built around the 110-year-old, 5,640-flute Massey Memorial Pipe Organ, which acts as the Amp’s tabernacle. The renovation and rebuilding of the venue literally took place around it, and the stone and brick work that encapsulates it. 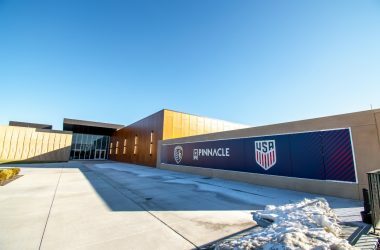 That also meant that Ronco’s teams—Churpita supervised four integrators who worked 16-hour shifts for more than a month on site—had to wait for even the trim and millwork to largely finish before they could begin. Ronco has been a vendor to Chautauqua for several years, most recently interconnecting fiber to connect several other buildings on the property, which form a huge community around the Amp. “In a way, the entire place is tied together with infrastructure,” he remarked. Two of the three Draper screens that are lowered on hoists from the rigging above the stage. The screens and the Yamaha CL5 audio console are the main AV components the venue doesn’t lease. Inside the Amp, hundreds of Whirlwind mic and SDI input panels allow access to any of the AV systems, almost regardless of where, in coming years, they might be installed. Each panel in the venue—from the back of house, to the stage, to the ceiling hang points—is carefully labeled and has a matching label on its counterpart in the patch room; that’s a key navigation aid for those who have to use the Medusa-like analog infrastructure. The Amp uses three projectors, focused on the central drop-down screen and two flanking screens. Epson projectors, supplied by Grisé, were specified for this season. The Draper screens are the one exception to the temporary-AV-hardware situation; the venue owns those and installed them, and they’re controlled via a hoist above the catwalk. Each of the video panels has six SDI jacks for the coaxial and fiber cable running to them. Dante jacks are in most of the wall plate interfaces in areas such as FOH, the venue’s new loading dock, and stage-right and -left monitor mix positions. BNC-connector jacks are also now in place for the video cameras installed each season. A Clear-Com intercom system, hubbed around an SB-704 four-channel switchboard main station, connects the FOH and stage manager positions, over a Dante-enabled network, to nearly two dozen other points in the back of the house. Not surprisingly, the Amp’s catwalk isn’t conventional, either, given the sheer amount of cabling; the trusses supporting the lights, sound and video are all accessible from above the ceiling. The venue was measured acoustically and the computer models simulated the venue’s seating areas, both full and empty. That was critical, because the seating remains in the form of hardwood pews. When empty, the acoustical reflectiveness is considerable, and it’s dramatically different from the room’s acoustical characteristics when full. Before any wire was run or any components hung, Jaffe Holden technicians took extensive measurements using acoustic modeling programs, such as Odeon and Catt Acoustics, to take an acoustical snapshot of the Amp before the original was demolished; they noted reverb time and other aspects of the venue’s aural signature. Given the lengths to which those involved were going to recreate the venue in a way that was as true to the original as possible, reassuring those who had wanted to keep the original in place, Jaffe Holden’s efforts were every bit as critical as those of the architects and integrators. “The first order of business here was, ‘First, do no harm,’” Mark Holden, one of the firm’s Principals, said. The calculations and modeling were done to simulate the venue’s seating areas both full and empty; that was critical, because the seating remains in the form of hardwood pews. When empty, the acoustical reflectiveness was considerable—dramatically different from the room’s acoustical characteristics when full. Holden said that, back at the firm’s offices, in its later modeling of the measurements, the team looked for ways to split the difference. Absorptive curtains and panels were considered, but they weren’t included in the initial budget, although they are expected to be implemented in subsequent seasons. Instead, Jaffe Holden focused its attention on the underside of the newly extended roof, which covers the stage and a seating area with a 20-percent larger capacity than the previous 4,000-seat maximum. Although the goal was not to harm the historically excellent sound, the acousticians were able to increase the reverb time slightly, between 0.2 and 0.3 seconds (200ms to 300ms)—enough to draw compliments later from the orchestra, its conductor and the house organist for the warmth that it adds to the sound. That reverb time was another balancing act, because one of Chautauqua’s traditional attractions are the lectures that take place over the course of the eight-week season. 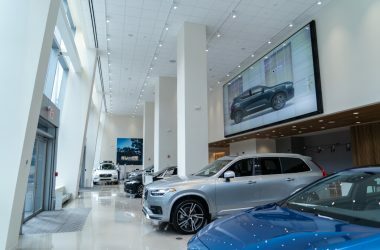 “We might have gone a bit longer on the reverb, but we had to keep spoken-word intelligibility in mind, and that demanded a top-of-the-line line-array speaker and DSP control system,” Holden noted. 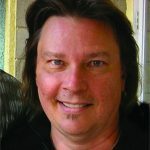 Chris Dahlie, Head of Audio at the Amp, has occupied his position at Chautauqua since he graduated from the University of Southern California in 1999 with a BS in music recording. Back then, too, the sound system came out at the end of each season and went back in each spring, as now continues. (In the past, the projectors and screens were set up and torn down per event, as needed; starting this season, however, they will remain in place as long as the rest of the AV equipment.) Until now, the Amp used the same sound system for almost 20 years. It was a stereo L-Acoustics ARCS rig with several peripheral elements, including JBL Perkins bins for the choir loft and Bose column speakers around the perimeter, with just the amplifiers being changed out a few times and system processing moving to QSC Raves from Peavey MediaMatrix. Dahlie agreed that the Amp’s seasonal model enables the venue to stay at the cutting edge of AV, as its technology changes faster than ever. 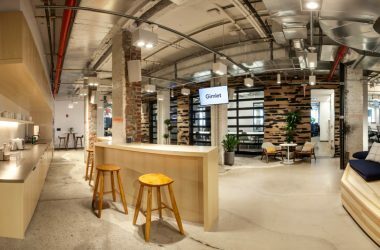 “At least, theoretically,” he added as a caveat, noting that would be subject to lease terms and other arrangements between the Amp’s management and its vendors. He placed more emphasis on the flexibility that the multiple-layered cabling infrastructure offers. “We based our design on providing stable, redundant and multiple kinds of connections, building-wide, for ourselves, our AV contractors and incoming productions,” Dahlie explained, noting that some music touring artists still prefer their own interconnect snakes. “Some will use the infrastructure that we have created, and some won’t. It just depends on the incoming production manager and audio team.” In addition, the copper provides a considerable level of redundancy and simplicity. Dahlie pointed out that Chautauqua’s somewhat-remote location means outside technical assistance can take some time to arrive, and copper is the ultimate fallback position for audio. Equipment choices for this inaugural season were made with a number of factors in mind. For instance, the L-Acoustics Kara sound system is one of a half dozen or so on most tour riders; that helps keep the venue attractive to a wider array of artists. System management is spread between the installed infrastructure and the seasonal components. The installed BSS processors are asked mainly to do signal routing, whereas the L-Acoustics LA Network Manager speaker-management software, directing the L-Net processing in each amplifier, controls whatever EQ and delay are needed through integrated DSP. Mark Holden, the acoustician, genially refers to the ceiling above the Amp’s stage as resembling industrial Swiss cheese. The horde of holes will help the venue anticipate its AV rigging needs far into the future. The acoustical aspects of the Amp’s renovation were deeper than most other entertainment venue projects, owing to the nature of its AV systems, which are installed and then de-installed seasonally every year. The rigging that would support the PA and projection systems must be extremely flexible to accommodate what, at least potentially, could be new or partly new systems each year. As a result, Holden said, the Amp’s new ceiling, designed in conjunction with theater planning and design consultant Fisher Dachs, resembles industrial Swiss cheese. “It’s plenty strong, but we had to try to anticipate their AV rigging needs far into the future,” he remarked.